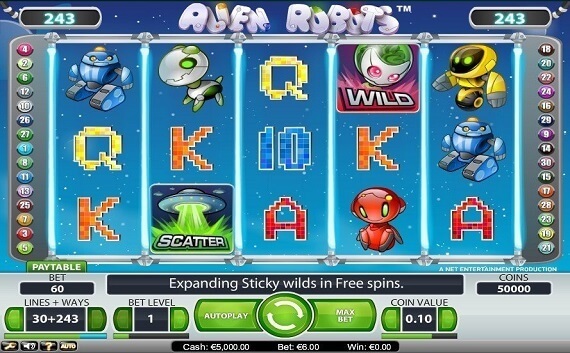 Alien Robots was developed by Net Entertainment, a gaming software development brand that has been providing unique online slot games since 1996. It is an online slot game that provides both casual and high rollers a chance to make the choice between playing with thirty pay lines and playing with 243 ways to win. Either way, the slot is played on a five reel and three row grid and features expanding sticky wilds, a re-spin and a free spins bonus game. This slot game is designed to be compatible with various operating systems as well as iOS and android for mobile devices at online casino sites NZ. The theme of Alien Robots is based on animated toy robots that travel through space. The robots are brightly coloured and the various coloured robots represent the higher valued cards as well as the wild symbol. These are red; orange; yellow; green; blue and white coloured robots. The higher valued playing card icons that represent the lower valued slot symbols are animated and appear pixelated and blinking. A low hum is heard in the background to portray the atmosphere of inside a spaceship while beeps and squeaks that sound as though the robots are talking to each other are heard throughout the game. All the sound effects are similar to those of classic arcade games. Regardless of whether the thirty pay line or 243 ways to win is activated, the coin limits are no different. Each of the Alien Robots coins can have a value of 0.01; 0.02; 0.05; 0.10; 0.20 or 0.50. Up to five coins can be wagered per pay line. The buttons that adjust the coin values, pay lines and bets per line are displayed below the reels. The current balance, credits and wagered amount are visibly displayed on the screen. Certain settings like the volume of the sound effects are adjustable and easy to find. Alien Robots has an auto play feature where 10; 25; 50 or 75 spins will spin automatically. The stop settings for the auto play feature are adjustable and can be set to the desired choice. The white robot is the Alien Robots wild symbol. This symbol appears with glowing pink eyes and a green brain that shoots lightning bolts. During the base game the wild symbol acts as a regular substitute for all the symbols apart from the scatter symbol. The wild symbol will however become an expanding sticky wild during the free spins bosanus round. This is where the wild symbol will expand to cover the entire reel and stick to the reel for one re-spin. The UFO symbol is the scatter symbol that will trigger the Alien Robots free spins bonus round when three, four or five land anywhere on the reels. Either 10, 20 or 50 free spins are awarded depending on the number of scatters that appeared. The expanding sticky wild and re-spin feature is activated during the free spins and any three or more scatters that appear will re-trigger another batch of free spins.